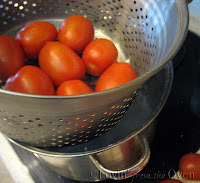 In making a no-salt spaghetti sauce for a relative, I had to ditch the idea of using tomatoes from a can. Some recipes call for skinning your tomatoes or using a food mill, which I don't have. In those situations, I choose to peel my tomatoes. 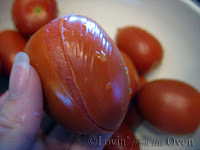 First, make an "X" on the blossom end of all your tomatoes for easier peeling. Next, get a large pot of boiling water. If you have a basket like this one, great, if not, don't worry about it. 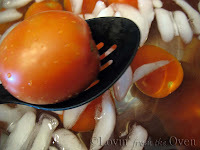 Submerge the tomatoes, a few at a time, into the boiling water for about 10 seconds. Roma tomatoes have a thicker skin, so I kept them in the water for about 20-30 seconds. Immediately put the tomatoes in an ice water bath to stop the cooking process. 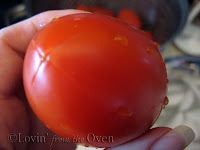 The skins have softened and begun to peel from the tomato. Using your fingers or the dull edge of a knife, the skin should come off easily. This method is great for soups, spaghetti sauces, or salsa. I love this tip! I often get lazy with tomatoes and apples and just don't skin them. Thanks!! Frieda, I always peel my tomatoes like this. This a good tip that everyone should find useful. I am really loving your new(?) blog. The Photos are particularly lovely. Very good tip,now I will give two good tips.I peel a lot of oranges and peaches.The orange,cut skin deep(just through the rine,to the orange),just like the tomato,except all the way around,then get under,and pull skin,from stem end,down.Now Peaches,cut all the way around,two times,and make sure,you run the crack in the side,if it clear seed,the crack,will split clean,then pull skin,from the stem end.I've done these all my life.I make my own orange juice,plenty of pulp,and the family loves,peach anything.Hope this helps!! I was taught this from a small kid.